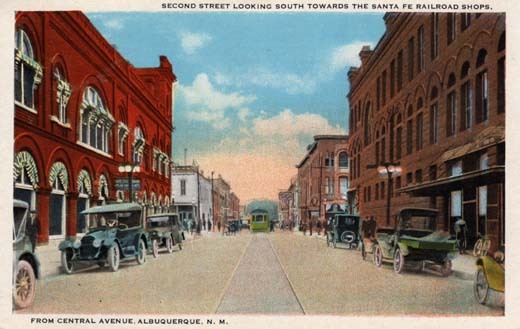 Central Avenue, Looking East, Albuquerque, N.M.
Second Street, Looking South, Albuquerque, N. M.
Second Street looking South towards the Santa Fe Railroad Shops, from Central Avenue, Albuquerque, N. M.
Second Street looking South towards the Santa Fe Railroad Shops, from Central Avenue, Albuquerque, NM. 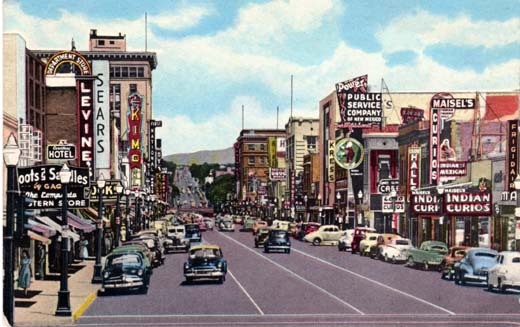 Second Street has been for many years a main shopping and business section of Albuquerque. It has some of the cities [sic] oldest and best established mercantile houses. A splendidly paved and lighted thoroughfare. Porter’s Views of Albuquerque and Vicinity. 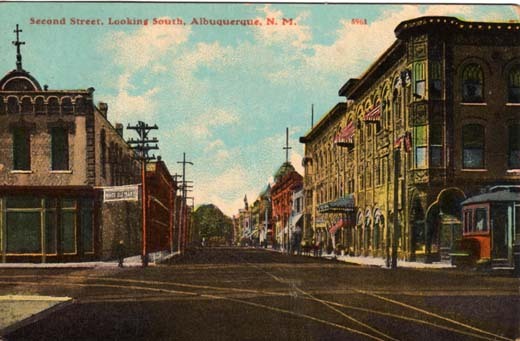 “Second Street looking South from Central Avenue”, Albuquerque, N. M.
Second Street, looking North from Gold Avenue, Albuquerque, N. Mex. 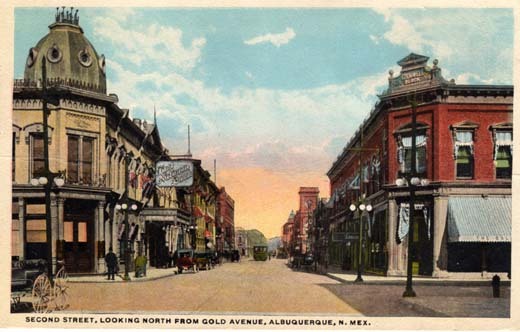 Second Street, looking North from Gold Avenue, Albuquerque, N. Mex. 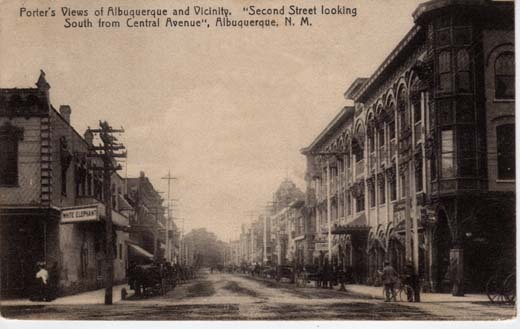 Second Street has been, for many years, a main business and shopping district of Albuquerque. 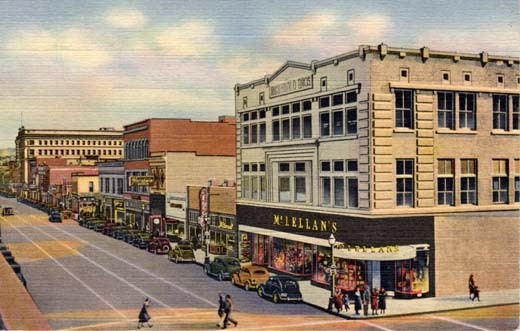 It has some of the city’s oldest and best established mercantile establishments. 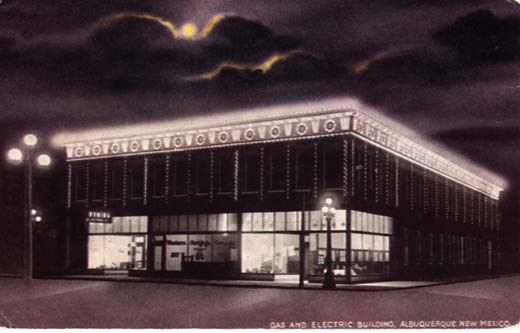 A splendidly paved and lighted business thoroughfare. 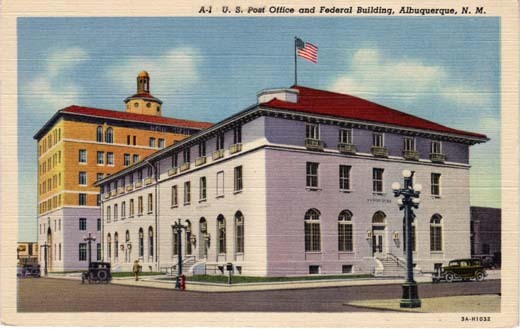 Second Street looking North, Albuquerque, N. M.
U. S. Post Office and Federal Building, Albuquerque, N. M.
Post Office and new Federal Building, Albuquerque, New Mexico The Albuquerque Post Office serves at this time over 40,000 people residing within a radius of five or six square miles. The recently completed Federal Building (the taller) is occupied by at least 20 different Bureaus of the U. S. Government Service. 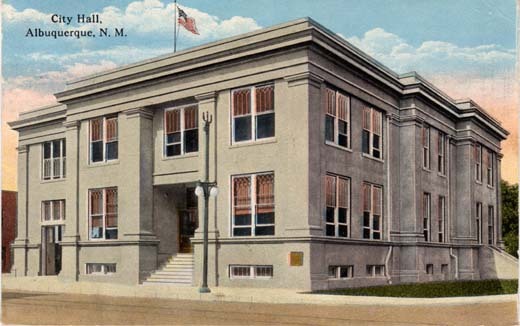 J.R. Willis, Box 665, Albuquerque N.M.
City Hall, Albuquerque, N. M.
City Hall, Albuquerque, N. Mex. Albuquerque’s new City Hall is constructed of reinforced concrete, at an outlay of $60,000. It has a capacity sufficient to take care of all city offices, including Mayor’s office, City Clerk’s office, City Engineer’s and Building Inspectors offices, Fire Station with sleeping and lounging rooms for Firemen, Police Court room, Police Judge’s and Chief of Police’s offices. City Jail, Heating and Electric and Storage plants occupy the basement. 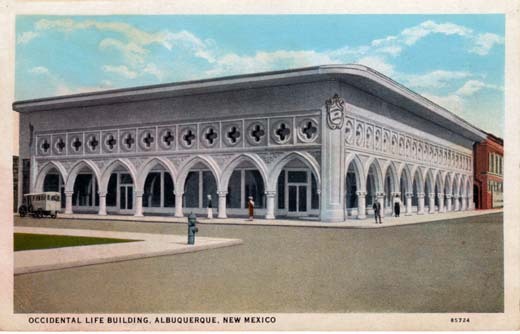 Wright’s Trading Post, Albuquerque, New Mexico. 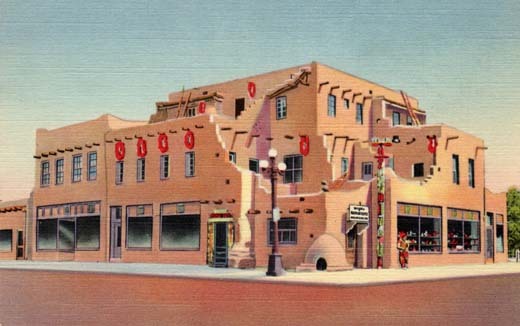 This building is in the typical Indian Pueblo style, with each floor terraced back from the one below. The strings of drying “chili peppers” decorate the houses with their brilliant color in the fall of the year. Note the top of a bake-oven on the roof, while in the foreground is a Navajo sweat house—replica of those used in the cure of the sick. This striking view is seen from the Santa Fe Railroad overpass, looking West. It is the heart of the shopping district with its modern buildings and up-to-date shops and stores. Central Avenue looking West, Albuquerque, N. M.
Albuquerque’s retail shopping district is famed for its neon lighting – and is at night a fascinating fairyland of multi-colored lights. 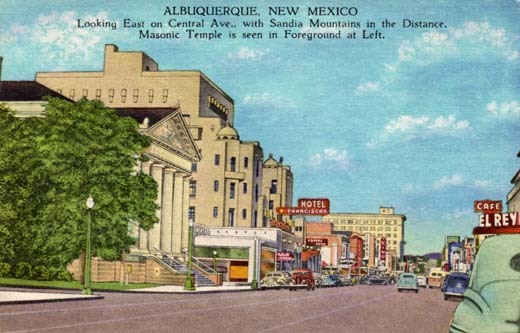 Albuquerque is also unique – being the only city in the world of this name. 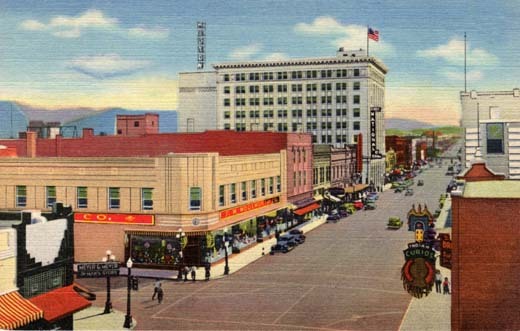 From Fifth St. may be seen the heart of the business district of the metropolis of New Mexico. 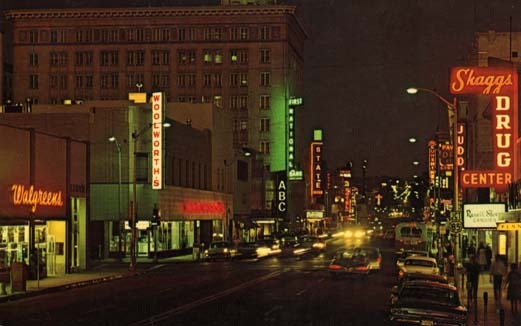 The fact that Albuquerque is rated as the best lighted city of its size in the U. S. attests to the progressiveness of the merchants. 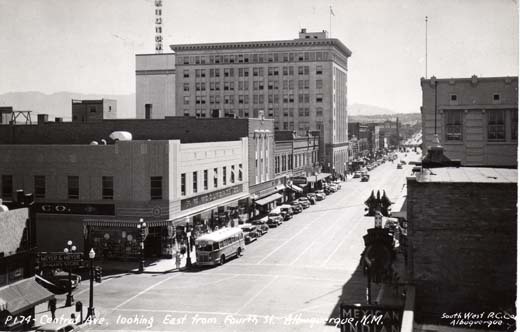 Looking East on Central Ave., with Sandia Mountains in the Distance. 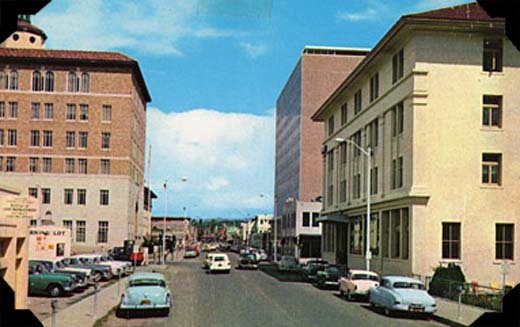 Masonic Temple is seen in Foreground at Left. 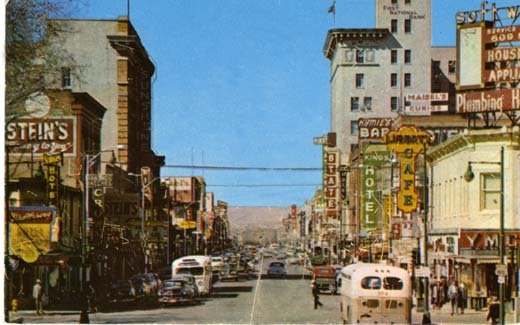 Here in Downtown Albuquerque, N M, you can see the lofty peaks of the picturesque Sandia Mountain Range. History rich, this 188 year old city retains much of the fascination of the Old Spain—yet it has been assigned a vital role in America’s future. 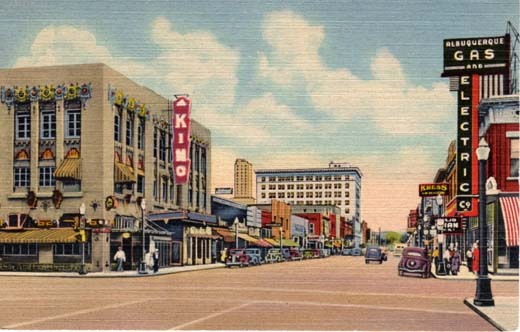 Albuquerque lies in the heart of Atomic America-in one of the most interesting and historic areas of the entire United States. At Albuquerque you are also in the heart of the Indian Country and within short driving range of matchless variety of scenic attractions. 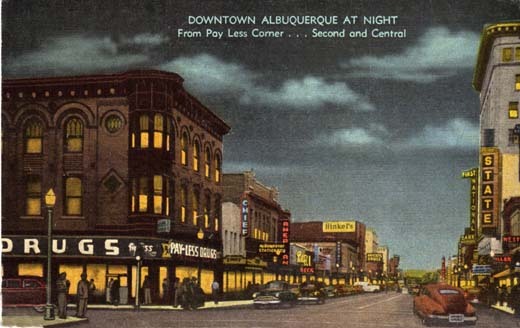 Central Avenue is the main street East and West and also U. S. Highway 66 through Albuquerque. 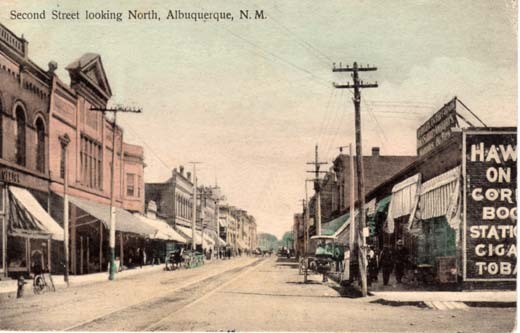 Central Avenue looking West, Albuquerque, N. Mex. 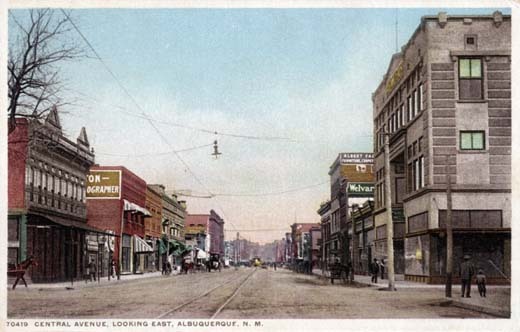 Central Avenue looking east from Fifth Street; Albuquerque, N. M.
Albuquerque is the Metropolitan Hub of New Mexico, altitude – 5,000 feet, population of over 100,000 people. 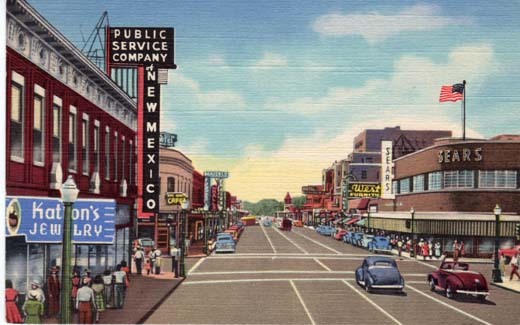 Central Avenue, the main thoroughfare of Albuquerque, New Mexico. This is also part of Route 66 which runs from coast-to-coast. 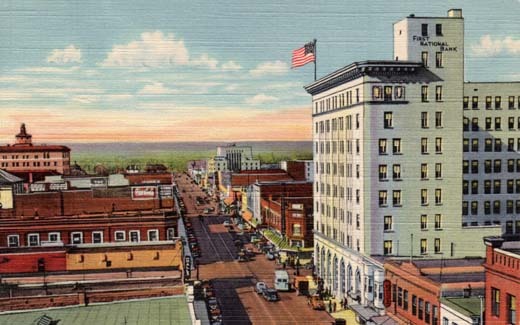 This Corner is the “heart of the city” where the two main thoroughfares cross and the center of the business district. Albuquerque, N. M. Looking Northeast in downtown Albuquerque. Straight ahead is Central Ave., which becomes Highway 66 East and West. 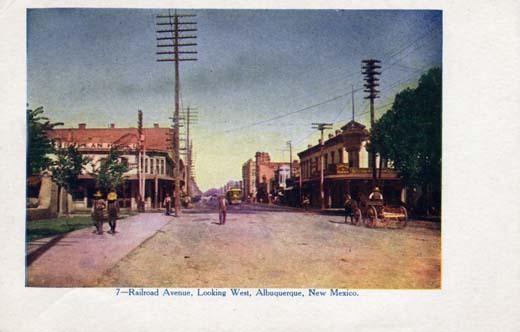 Fourth St., becomes Highway 85, North to Santa Fe and Taos, South to El Paso, Texas. 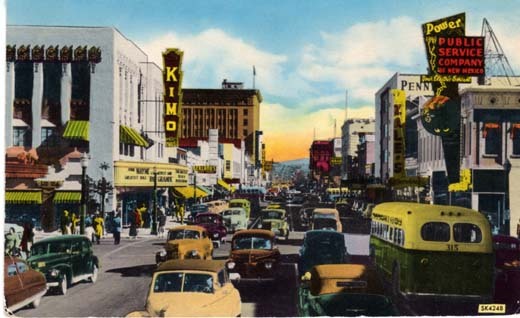 Central Ave. and Fourth St. in the heart of Albuquerque, N. Mex. Looking east on Central Ave. which is Highway 66 east and west. 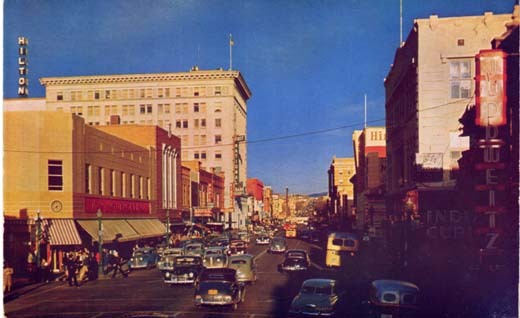 Fourth Street is Highway 85, north to Santa Fe and Colorado points, south to El Paso, Texas and Old Mexico. 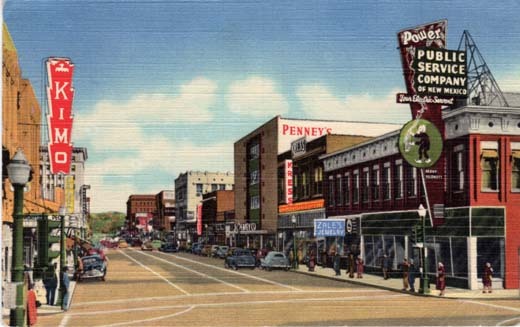 Central Avenue and 4th Street where U. S. Highways 66 and 85 cross north and south and east and west. Mike Roberts Studios, Berkeley 2, Calif.
Albuquerque, is one of the fastest growing cities in the nation. 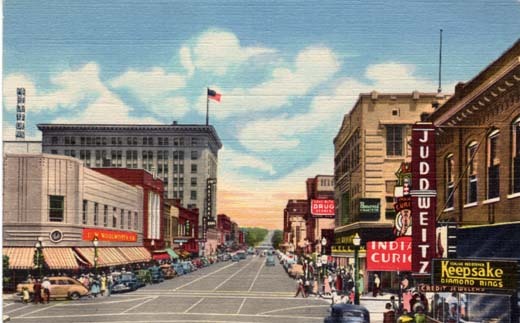 This is Central Ave. looking East, showing the great progress made in modernization of the downtown area. Fourth Street looking south from Central Ave. Albuquerque, N. M. Fourth and Central is the cross road of East-West Highway U. S. 66 and North-South Highway U. S. 85. 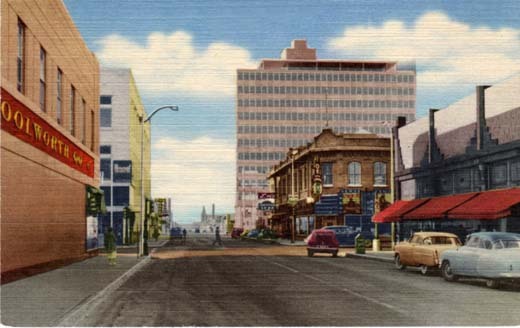 Skyscraper shown, the Simms Building, is located at Fourth and Gold Ave., S. W.
Gold Avenue Looking East From Fifth Street Albuquerque, New Mexico Prominent buildings shown in this view are, on the left, the Federal Building and Post Office, on the right the Elks Club and the modern Simms Building.